Rekognition is a facial recognition technology produced by Amazon which has been pitched to U.S. Customs and Border Protection (CBP) and U.S. Immigration and Customs Enforcement (ICE) to help identify immigrants who are potentially undocumented. This system has been built to analyze an image or video to confirm identities through a comparison with live images and reference images. This leads to stigma, racial profiling and biases people have surrounding immigrants and people of color. We need to keep this technology out of the government to keep our neighbors’ and our privacy safe. This new facial recognition technology is concerning to privacy advocates as it demonstrates a violation of basic rights and the expectation of privacy common in our daily lives. With a large majority of Latino immigrants living in Queens (the location where Amazon was going to build their headquarters), the collaboration of this tech giant and ICE would have instantly brought fear and danger to the surrounding community. Due to community responses, Amazon cancelled their plans to build the HQ2 facility in that location.Some so-called “sanctuary cities” throughout the United States risk becoming an idea of the past, as this new technology would collect license plates, fingerprints, and facial photographs and use that information to arrest, detain and deport our neighbors, despite the protections of policies and fundamental right to due process we claim as part of our nation’s democracy. Trump’s federal police would have full access to in-depth personal information based on technology that codifies racial profiling. We cannot stand for legitimized racism in the enforcement of our nation’s outdated immigration laws. Facial recognition, along with other immigration enforcement technology tools, have become threats in many cities throughout the U.S. In California, some cities are trying to cut ties with tech giants that cooperate with ICE. Even if we live outside of California or Queens, our tax dollars are going towards tech-systems through the Department of Homeland Security (DHS). Amazon and the like are only encouraging it to go further. The praise, enticement and predictive policing patterns fueled by profit must stop. Why and how does this threaten our values? Click here to see a visual representation of how Amazon profits off of increased immigration enforcement. 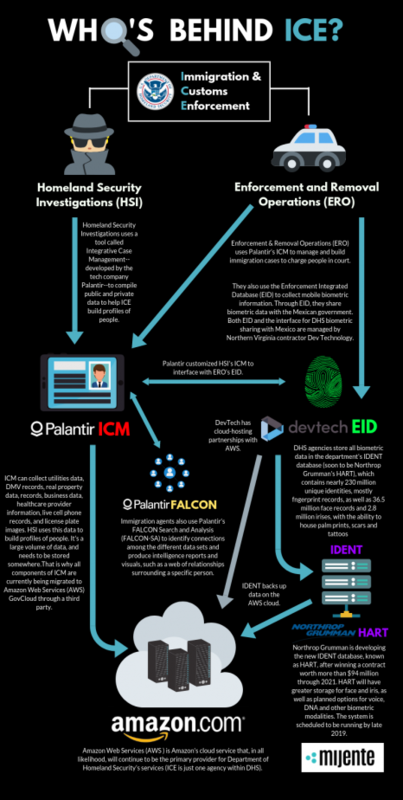 Demand that your state, city, or municipality end contracts allowing information sharing technologies to/from ICE (Rekognition), end contracts with private data brokers working with ICE, and terminate contracts with predictive policing programs that are hurting community members. Spread the word. Share this post, articles, and comments on your social media feeds. Invite your friends, families, congregations, organizations and colleagues to sign the petition. Take your business elsewhere! Shop local and support local business owners to use our collective buying power to pressure Amazon to change their priorities. Read the full report, “Who’s Behind ICE: The Tech and Data Companies Fueling Deportations”, produced by Mijente, National Immigration Project, and the Immigrant Defense Project, online here.